Topics: Who We Are, Services, and Research. Age: It went live on June 6th 1999, making it over 18 years, 10 months old. It is hosted by American Registry For Internet Numbers (Virginia, Chantilly,) using Apache/2 web server. There are 2 Nameservers, ns2.nocdirect.com, and ns.nocdirect.com. 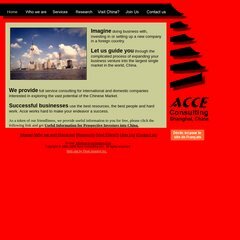 Acce-consulting.com's server IP number is 69.73.152.88. PING (69.73.152.88) 56(84) bytes of data. A ping speed test response, is timed at 46.8 ms.